This can be accomplished by clicking on the 'Exchange' tab. 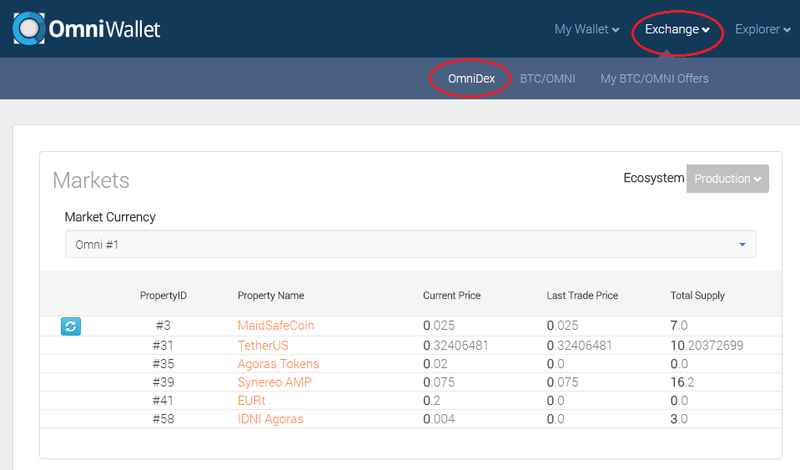 The 'OmniDex' tab will be the default selection. The Market Currency is the Token/Asset you want all your Market orders to be priced in. By Default the Market Currency is set to Omni #1. You can change the Market Currency to any other Token/Asset that has active orders. 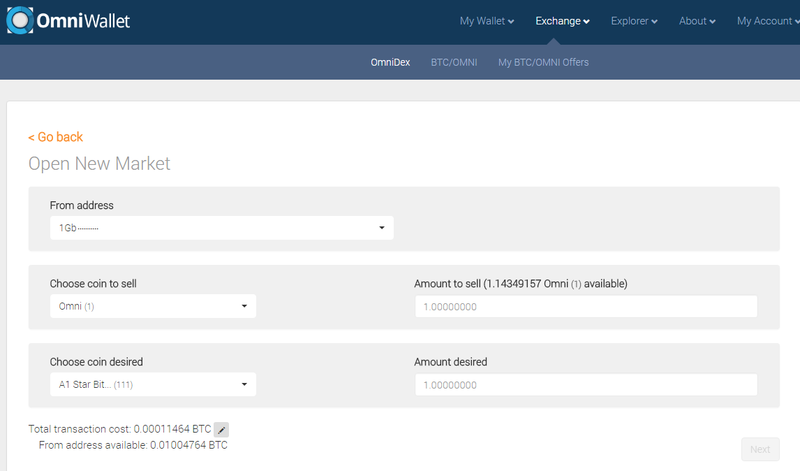 This can be completed by choosing the preferred Market Currency from the drop down list. 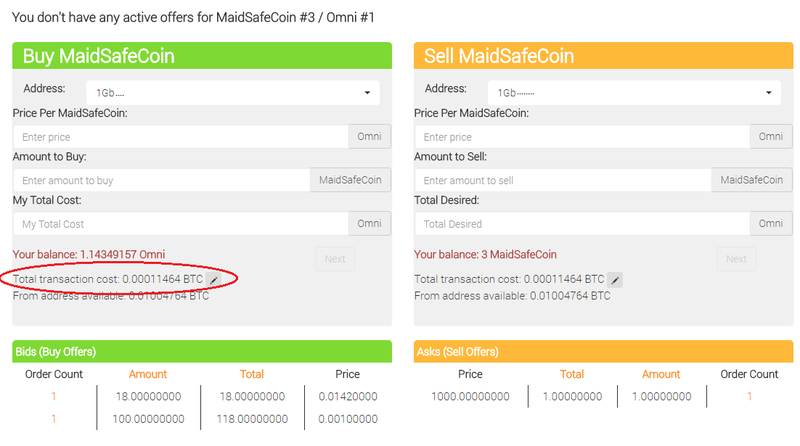 You can see in this example that the Maidsafe market is currently selected and active. 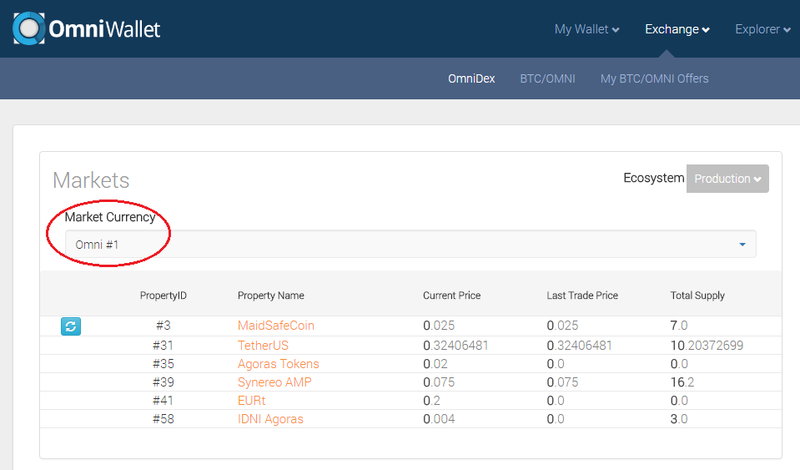 You can select/change the Market by clicking on the Property name for the desired Market. Scrolling down the page below the Markets will reveal the current Orderbook. 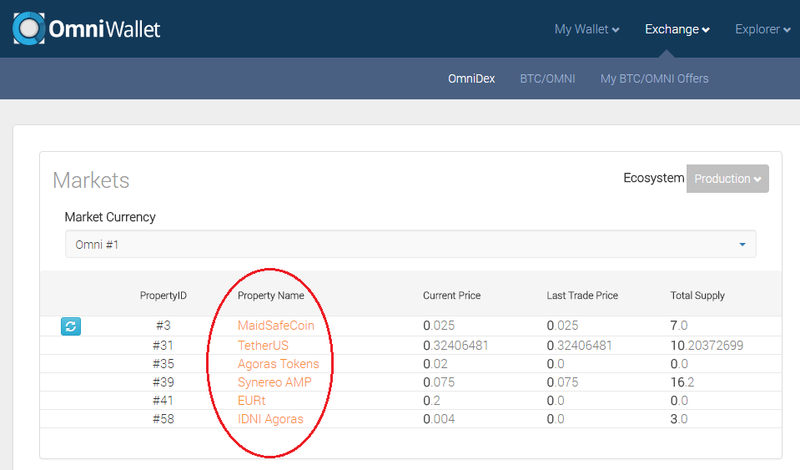 You can see both sides of the orderbook (Buy and Sell) are listed with the relevant order information. Amount: The sum of the Amount Selling/Buying of all orders at this price point. Total: The sum of all the Amount's up to this row and before it. Basically the total amount Selling/Buying at this price or better. Price: The effective Unit Price of the order. If you wanted to Match against this order this is the price you would need to pay. Just above the orderbook are the order forms. You can place your Buy/Sell Orders using these forms. 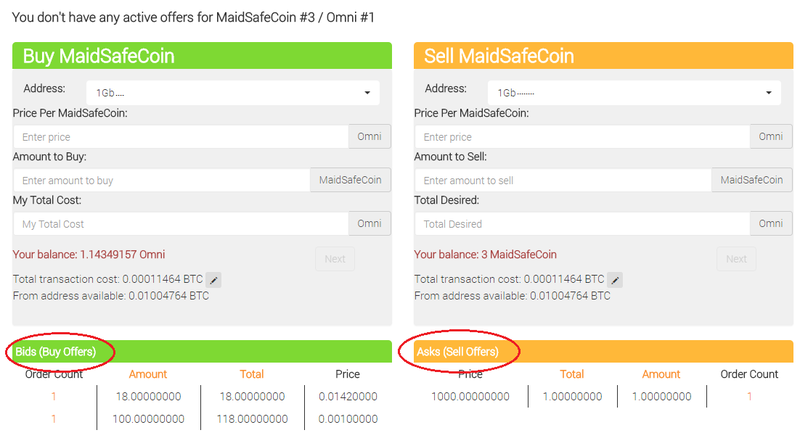 Then you can enter the price you want to pay in the Market Currency and either the Amount to Buy/Sell or the Total. Note: the form will automatically calculate the Amount To Buy/Sell or the Total Cost/Desired fields when you enter information into the other two fields. Once all the fields have been filled in and are valid the green 'Next' button will become enabled and allow you to proceed to the Review and Confirm modal. 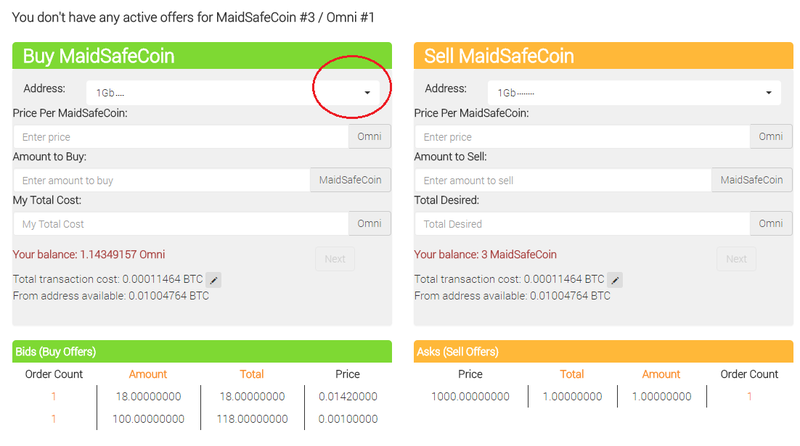 Once you are happy with the information broadcast the transaction, otherwise cancel/close the modal to change the order information. All Pending orders should show up in the orderbook relatively quickly and will be highlighted with a blue bar/background. Pending Orders are orders on the blockchain that have not confirmed. They may or may not be valid and their validity can ONLY be determined once confirmed. Once the pending order confirms it will be checked for validity and any matches against open orders. If it matches and is filled it will disappear. If it is not filled then its background will clear and if it did not match against an order in book . 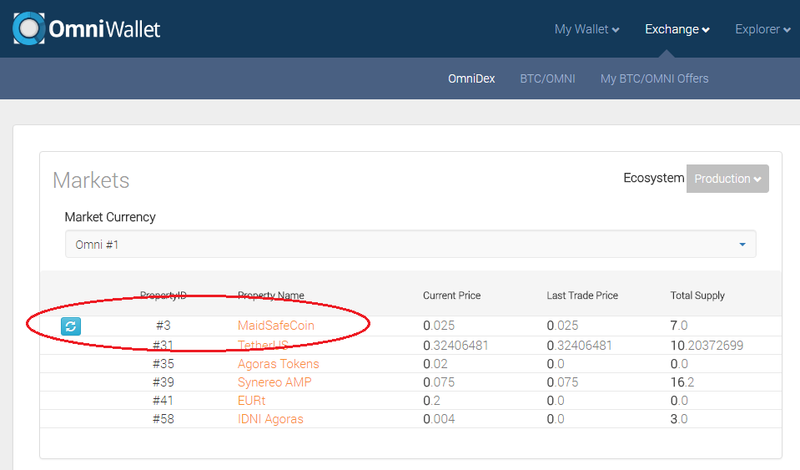 Any open unfilled orders (both Pending and Confirmed) will be displayed under the 'My Active Offers for <Market/Market Currency>' heading. Confirmed orders will show the current Amounts remaining For Sale/To Fill and will have an option to cancel the Offer if you wish. If the Market Currency/Pair does not exist for the Market you want to sell/buy on you can start a new market. Help, After importing my private key and the address I get is different than what I expected! Help, I accidentally deleted my address which wasn't backed up! Help, I changed my password and now I can't login! Help, I lost my Wallet ID! How do I Backup\Export my wallet \ access my private keys? How do i Import Restore a wallet backup? If I create a wallet on one PC, can I log into another PC and use it from there?